Spring gobblers are tough. Fall turkeys are different. Like the landowner that borders your hunting lease and your mother-in-law, fall turkeys are hard to figure out. The key to tagging one is breaking a flock, knowing the composition of that flock, and making the right calls. Here are the five calls everyone should master to improve their odds on fall turkeys. This call is the bread and butter of a fall turkey hunter's arsenal. The call is used to imitate juvenile turkeys attempting to regroup with their family flock after a break. This call can be made on a box, slate, or wingbone call, but is easiest to reproduce with a diaphragm or tube call. 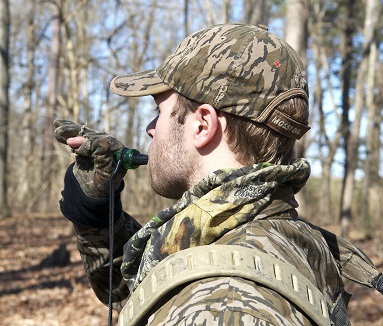 Listen to real turkeys or recordings to see what it sounds like and add it to your bag of turkey hunting tricks. A good brood hen can have her family flock reassembled in 15 minutes or less after a break. Imitate the brood hen by yelping plaintively 10-15 times and waiting for a response. A lost yelp can help locate silent turkeys. Yelp on a diaphragm or other high pitched call 10-20 times and wait for a response. You may only hear a cluck or two, but this will be enough to let you know where a flock is so you can move in for the break. Turkeys use this call to maintain their personal space. With their heads down feeding, they will cluck and purr softly to maintain contact with the flock. When a fight breaks out, the purring becomes more aggressive. Other turkeys will come in to see what is going on. In the fall, you are calling to the kind of turkeys you want to kill. If you are after adult gobblers you will need to sound like a gobbler. Make one coarse cluck, followed by three raspy, slow-paced yelps to sound like a fall gobbler. Be prepared to wait a while for gobblers in the fall. While you won't hear the woods lighting up with gobbles like in the springtime, fall turkeys do gobble. In the fall, the gobble is a sign of dominance and social status in the flock. Use it as a last resort to attempt to bring in uncooperative fall gobblers. Whether you choose to harvest hens and young turkeys or target jakes and fall gobblers, there is no better time to learn turkey vocalizations firsthand than the fall season. Get out today and try your luck. Who knows, you may enjoy it more than the spring season.